With over 70% of consumers saying they find it annoying when brands send them emails promoting products that are not of interest to them, the pressure is on for ecommerce marketers to make their content as engaging and relevant as possible. Many of the above require a centralised view of all the data available on a customer (also known as a single customer view). This product recommendation fail is likely to anger a recipient, making them feel like their purchase history means nothing to you. Nothing. Advice: To combat this terrible occurrence, make sure your product recommendation engine is linked to all of your customers’ order data and onsite interaction data. The delay between the engine fetching the data and an email being sent needs to be as small as possible. You finally manage to grab a subscriber’s attention with your bespoke product recommendations, only for the details to be wrong; for example, there’s a flash sale on, but the product displayed in an email shows the old price. Advice: Our only real tip here is to always ensure your product recommendation engine updates in real-time (or near real-time). You could also try previewing the recommendation a few times, for different recipients, to check everything is correct. According to our research, one of the top consumer frustrations with email marketing is being sent emails featuring products that aren’t even available. We’ve all been there: you’re finally sent a recommendation you really like, only to click on it and be told it’s out of stock. This fail tends to happen when a recommendation engine doesn’t take into account stock, or doesn’t receive an update on a brand’s stock in real-time. Likewise, sometimes a product will be in stock when it’s first sent out to subscribers, but by the time every person has opened it it’s already sold out. 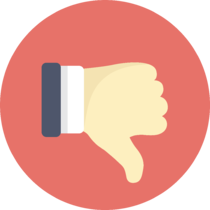 Advice: If you can, don’t recommend any products that have less than a certain threshold of items in stock. One way to do this would be to create a rule in your product recommendation engine that would prevent it showing any products that have less than a certain amount of units in stock. This can be annoying at best, humiliating at worst. 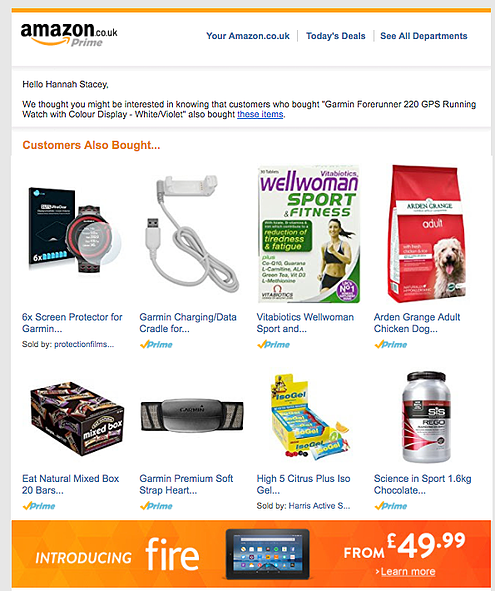 See if you can spot the slightly left-of-field recommendation below, sent to our marketing manager Hannah after she bought a running watch on Amazon. Hannah doesn’t have a dog, Amazon. This unfortunate fail can happen when a product recommendation engine draws on similar attributes from other buyers who bought something similar to the customer before (or that customer's purchase history), such as such price point, patterns of purchase, category, size, colour etc. At an algorithm level, the engine might well make sense, but at a product level it simply doesn’t. This tends to happen when there is something wrong with an algorithm or set of data. Examples include: creating a template designed to recommend your brand’s most popular items, but when the email is sent out the products shown are not that popular; or an email recommending brand new arrivals in your store, but accidentally displaying old products. Advice: Double check that your brand’s most popular/best selling items are indeed the products being displayed in your product recommendations. This is also a good way to check your data is accurate and your recommendation engine is in sync with your ecommerce platform. Ideally, you’d handpick products to make sure they look nice next to each other in an email, but, when it comes to automation, this isn’t really possible. You could apply additional rules to an algorithm that forces certain categories/colours next to each other, but this pretty much breaks the overall purpose of the algorithm in the first place. Advice: In certain instances, you can check/preview the email before sending it to check all looks okay - for example, when sending objective, non-personalised product recommendations such as “best-sellers”. Unfortunately, this isn’t possible with more personalised filters. Having a good understanding of how your recommendation engine works so you can step in should anything go wrong. Always keeping an eye on your data to check it’s accurate (and matches the recommendations being created).